Home > Solar Policy > Should Electric Cars Be Subsidised? So far this year there has been a fair bit of debate over whether electric cars should receive subsidies in Australia. The Greens are in favor and SA Labor were planning to make electric cars exempt from registration fees up to the point they were defeated in savage hand-to-hand voting. Our Federal Minister for the Environment and Energy, Josh “build me a fleet of new coal power stations” Frydenberg has come out of closet, or possibly coal bunker, as a fan of electric cars. Probably because they can be charged with coal power. But he hasn’t mentioned any subsidies and our honorable1 Member for back-to-the-19th-century-backbenching, Craig Kelly, has assured us that there will be no subsidies for electric cars and that Josh just wants to make sure there are no bureaucratic impediments to people deciding to spend their own money on electric cars. So the question is — should electric cars be subsidised? My short answer is — no. It makes no sense to subsidise electric cars when what we should do instead is make those who emit greenhouse gases and toxins into the air pay for the harm they cause. But I’ll give you another short answer for the same low price as my first one — yes. Because our current politicians are unlikely to put a price on pollution, some sort of subsidy on electric cars and potentially other low polluting vehicles could be a less efficient, second best policy. A few days ago I wrote about how, contrary to some people’s beliefs, electric cars don’t result in greater greenhouse gas emissions than the average petrol powered car. I also pointed out that, according to official fuel economy figures at least, a hybrid car or even a small, fuel efficient conventional petrol car will result in less greenhouse gas emissions than an electric car charged from Australia’s coal heavy grid. This is true even if you live in Tasmania or South Australia with their high levels of renewable energy generation, because charging an electric car there means less clean electricity will be available for export to dirtier states. The good news is you can drive an electric car with zero or next to zero emissions (beyond what was required to make it) if you installed rooftop solar to charge it. For an electric car driven the annual average of 14,000 kilometers, around 2 kilowatts of solar panels is all that’s required. While electric cars charged with today’s grid won’t reduce greenhouse gas emissions by as much as some expect, what they do excel at is reducing the amount of toxic air pollution in Australian towns and cities . It’s been estimated air pollution kills 3,000 Australians a year and roughly 75% of it is produced by vehicles. So pollution from Australian cars and trucks probably kills well over 2,000 people a year2. Last year 1,227 people were killed in road accidents which means the total death toll from vehicle use was probably over 2.5 times higher. 1. To reduce the suffering and death around the world resulting from global warming caused by greenhouse gases emitted from burning fossil fuels such as oil. 2. To reduce suffering and death in Australian towns and cities caused by air pollution. 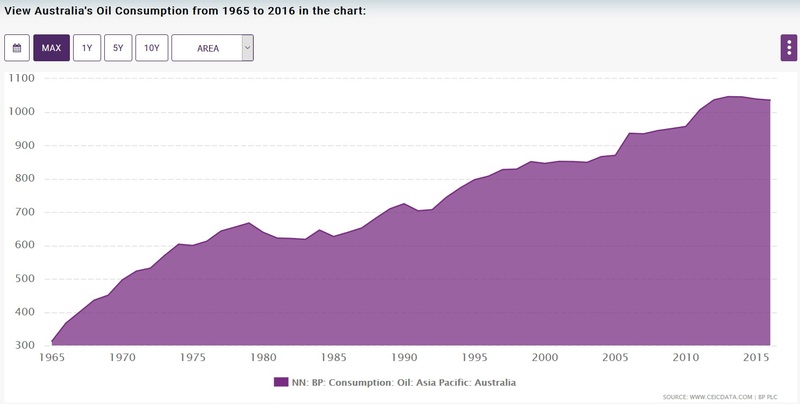 At the start of this century Australia produced around 700,000 barrels of oil a day. Now it’s under 200,000. We use around 1 million barrels a day. In addition, most of Australia’s oil is exported, which means almost all the petrol and diesel used by Australian vehicles is imported. Because of Australia’s reliance on imported oil there is some concern about national security and what would happen if there was an interruption in supply. But Australian politicians are astoundingly unconcerned about this. We live in the only developed country in the world that has no fuel efficiency standards. The entirety of our national fuel economy measures consists of requiring new cars to have a sticker with their fuel consumption on it. While tax makes up a large portion of the cost of petrol and diesel, Australian fuel taxes are still low by developed country standards3. We only have enough oil set aside to last us about 6 or 7 weeks if imports were cut off instead of the 13 weeks that is internationally recommended for an oil importer. The situation has me wondering if there are people hoping for a supply disruption so a government funded coal to liquids plant will be built4. So if you don’t trust world leaders to play together nicely you might think it’s a good idea for Australia to cut its reliance on imported oil. Personally, I’m not too worried. I’m convinced Trump is too lazy to start a war5. At least intentionally. Australia already has a hefty incentive for people to go electric and that’s the 40 cent per litre fuel excise on petrol and diesel. Of this about 10 cents goes to pay for roads with 30 cents going into general revenue. So is this extra 30 cents enough to make petroleum fuels pay for the environmental and health harm they cause? It’s not too difficult to show this is the case by roughly estimating the cost of the environmental damage from CO2 emissions and health effects from burning petrol and diesel. 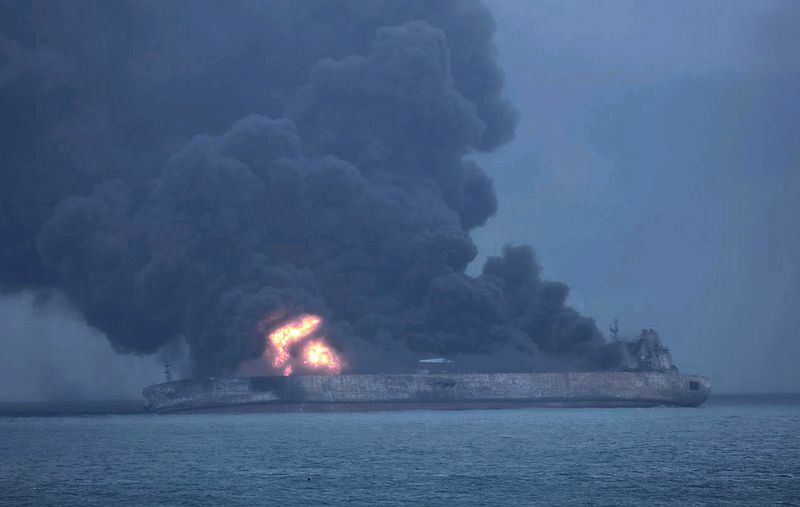 Attempting to put a dollar figure on the amount of harm caused by a tonne of CO2 emissions from burning oil products is extremely complex and estimates vary. Fortunately we don’t need to worry about that. My approach is very simple. The amount of additional CO2 we can safely add to the atmosphere is zero, so the cost to our society of emitting one tonne of CO2 is equal to the cost of removing it from the atmosphere and sequestering it long term. There are a variety of methods to do this. Reforestation, afforestation6, creating and burying biochar, grinding up large amounts of olivine rock that slowly absorbs CO2, dumping agricultural waste in deep ocean waters, and so on. If one or more of these methods can be used for $100 a tonne on a reasonable scale7 then since burning one litre of petrol results in the emission of around 3.15 kilograms of CO2, the cost of cleaning that up would be 31.5 cents. Unfortunately we don’t actually know how much it will cost to remove and sequester CO2 from the atmosphere, but the lowest estimate I’ll accept is $70 a tonne. If we use this as a minimum, then burning one litre of petrol will result in a clean up bill of 22 cents. So maybe the 30 cents per liter of the fuel excise that goes into general revenue could cover it if they renamed it the Petroleum Fuel Carbon Price. But the fuel excise is not also going to be able to cover the health costs, because they’re a doozy. In 2007 it was estimated air pollution killed around 3,000 Australians a year and the cost was $11 to $24 billion. While cars have hopefully gotten cleaner in that time, the value we put on our lives will have increased. If we take the mid-point of that range, adjust it for the fact that roughly 75% of air pollution comes from vehicles, adjust for inflation, and then increase it by 16% to allow for population growth, it comes to $20 billion. With around 32 billion litres of petrol and diesel burned in built up areas per year, the health costs would come to 62 cents per liter. I have no idea how to work out the cost to national security of being almost completely dependent on imported oil and I am not even going to try. But it definitely costs something, so if you like, please feel free to add your own estimate to the total below. Air pollution affects agriculture and makes our cities grimier. While I won’t attempt to estimate agricultural losses or the cost of extra cleaning required, these losses are real and should be included in a full and detailed account of the costs of air pollution. If the health costs come to 62 cents and the cost of greenhouse gas emissions are at least 22 cents, then we are looking at 84 cents or more per litre from just those two effects. That’s not that far off $1 but I’ll just go with 84 cents for now. So the 30 cents of the fuel excise that goes into general revenue doesn’t nearly cover it. Rather than subsidies for electric cars, in my opinion we should make all vehicles pay the full cost of their emissions. This will encourage the uptake of electric cars, but it will do it in the most economically efficient way, since it makes sense to directly attack the causes of global warming and air pollution and not come at them in a round about way by subsidising things we think will help. The cost of greenhouse gas emissions can be added directly to fuel prices. This makes sense because we can be certain all the fuel is going to be burned. No one is likely to be injecting petrol back into an oil field. The cost of air pollution could also be added onto fuel prices, but it would also be good to give people an incentive to buy vehicles that pollute less per litre of fuel burned. It could also be helpful to have some of the cost front loaded into the purchase price of vehicles, as humans often pay more attention to that than running costs. But this could be problematic as car manufacturers have become very good at gaming pollution and fuel economy measurement tests. Should fuel efficient hybrids or small, economical petrol and diesel cars get subsidies too? What about a car with average petrol consumption but extra pollution control equipment? How about hydrogen powered cars? It would be possible to reasonably estimate the benefits and thus amount of subsidy for each, but it would be impossible to get it exactly right. Subsidising electric cars means we will end up with more cars in total than we’d have otherwise and this will result in more congestion on the roads. If self-driving taxis reduce the need for private car ownership in the future, then many of these vehicles and extra roadworks to support them may end up a wasted investment8. Why should car owners get a subsidy and not people who use public transport or ride a bike or walk or never leave the house? If installing rooftop solar or investing in energy efficiency would provide greater benefit should it receive the subsidy instead? It should apply not just to electric cars but to all cars that meet minimum health and pollution standards. Be on a sliding scale so people will have an incentive to buy the best vehicles rather than ones that just meet the minimum standard. Take into account the expected change in emissions intensity over the estimated lifespan of electric vehicles. The portion of people who charge electric vehicles fully or partially with rooftop solar should be accounted for. If this seems complex to you, that’s because it is a bit complex. Added complexity is one of the reasons I favor making polluters pay rather than providing subsidies. I am sure there are people who will say it won’t be politically acceptable to make people pay for their vehicle’s pollution and increase the cost of petroleum based fuels or the upfront cost of polluting vehicles. “The punters won’t stand for it!” they’ll say. But money could be taken from punters with one hand and given back with the other. All car owners normally pay over $700 a year in car registration. So if annual fuel cost were raised by $500 for the average driver, everyone could receive a $500 reduction in rego costs. This would result in the same incentive to drive less, use public transport more, cycle and car pool more, and to purchase a cleaner vehicle in the future, but on average drivers would not be financially worse off. Also, this change could be gradually phased in rather than suddenly introduced to lessen the shock. There is a 10% GST on cars and this could be reduced for clean ones and increased for dirty ones. I know there will be opposition to making an exception to GST rules, but that’s okay, it can be called something else to make it more politically acceptable. And for people who can afford hoity-toity cars, the luxury car tax could give even more benefit to clean cars and hit dirty ones harder. I’m not saying it won’t take effort to get people to accept these changes, but it could be done. Just as politicians can get many people to go along with lies if they repeat them loudly and long enough, they can also get them to go along with the truth provided they put the effort into reasonably explaining why Australia will be better off with the change. Our family has owned an Imiev for almost 5 years. Now ~75000 Kms. I feel EVs should be exempt from GST for say 5 years so ordinary families have a small financial incentive. Also the charging network needs to be improved. My feeling is the cost of Fossil fueled cars will increase over the next few years due to the reduced number of ICE cars sold worldwide. Electric cars will reduce in cost due to the increased numbers. In the future the electric cars will be cheaper than ICE cars (Particularly for the TCO) Also you are correct in all the fuels currently used for vehicles & industry being imported. Our Balance of trade will improve when the fuel imports reduce. Personally, I think the big change will come when Electric traction is used in Agriculture. 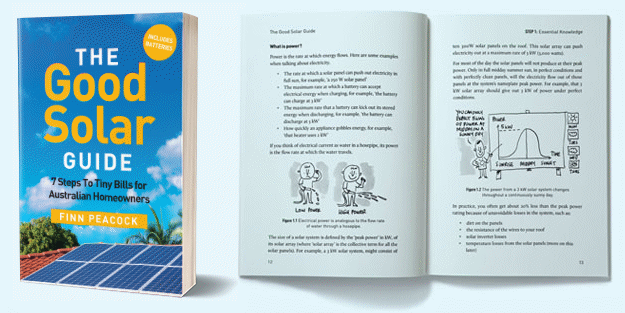 It is already possible to buy a containerised power station that could be used in farming. Add storage, & rebotised tractors working 24/7 then we have an economical future for farming! (currently farming is at the mercy of the World oil price). Of course, extra power generated can be sold to the grid for extra income, & that power will mesh nicely with the need for grid power for EVs. You forget one simple but effective solution option, that would directly save lives, apart from saving lives through reduced pollution. That is the option that is very strongly opposed, includeing being opposed by motoring organisations, suc as the RAC of WA; mandatory regular (six monthly) roadworthiness testing of all motor vwhicles (with the requirement that any motor vehicle being sold, be reqired to have passed roadworthiness testing, no more than three months before being sold). Road transport would be much safer, if all motor vehicles would be required to have adequately working, and, safe, braking ability, and, would be required to have sufficient tread on all of the tyres, and, steering that works adequately, even if the ddrivers still are allowed to be totally incompetent, with drivers licences effectively given away free with packets of cereal. And, the mandatory reulary roadworthioness testing, could take motor vehicles off the road, that, whilst they are supposedly burning nice,celan, environmentally friendly, lead-free petrol, appear to have a coal fired setam locomotiove under the bonnet, from the cloud of smoke comining out of the exchaust pipe. Oh, and, prithee, tell; how is it so, that “An electric bicycle subsidy might be a great idea. It gets people exercising” – what exercise is there, in some lazy &%^$ sitting on their bulging backside, letting a motor, be it an electric one, or, otherwise, propel the bicycle?And, it is aggravated, as I saw yesterday, with a motorised bicycle (a supposed pedal-cycle, with a motor propelling it), with two people, riding along a metropolitan footpath, at about 60km/hr, with two people on it, with no safety equipment, like helmets or anything. At the speed that they were travelling, if a pedestrian (incuding the prospect of a toddler) happened to walk onto the footpath and get hit by these jids on their high speed motorised bicycle,, the cost to the taxpayer, in trying to patch them up, if they survived, would not be trivial. So, bicycles with electric motors, are not “a great idea. It gets people exercising” – they are not healthy, especuially when driven at high speeds (for footpaths), on footpaths. And, because the riders regard these mototor vehicles as being outside the law, they also tend to ride (around here), on the wrong side of the road, and, go around roundabouts the wrong way, and, ignore traffic signals. After all, such motor vehicles are outside the law, and, are encouraged by the state parliament, which allows them to endanger people. It would be far safer, to have a coal fired steam-driven car, chugging alond the road – they do not go as fast, and, they make enough noise, for animals (including the animals that are people), to get out of their way. Oh, and, that is yet another issue about electric cars – they can mnot always be heard, especially by people with hearing disabilities. And, regarding driverless cars, …. I assume that you have heard that in a state of the USA, a trial of driverless cars by Uber (I think it was) has been banned,after a car, with a person in the “driver’s seat” ran a woman down and killed her, to the shock of the person in the car. Unfortunately, due to the dictatorial form of government that we have, we are going to have driverless vehicles imposed on us, regardless of how dangerous they prove to be, and, regardless of how many people they kill. And, there is nothing that we can do about it. As you state Ronald it apparently takes a 2kw solar system to produce enough home charging to run an EV for average usage.. Why not provide a subsidy based on this requirement. If you instal an a/additional 2kw of solar power to your home you will qualify for a rebate. On present costs this would be in the region of $3000. Sounds simple enough and eliminates the claim that EV are are no less cleaner than ICE cars because they charge using FF generated power. When the grid reaches say 50% RE then the subsidy stops. 1. “Subsidising electric cars means we will end up with more cars in total than we’d have otherwise and this will result in more congestion on the roads.” – I would like to know what scientific research backs up this statement? An individual can only drive one car at once. Additionally, intelligent self-driving EVs offer the promise for far greater efficiency of the transportation system than the current system as they can be programmed to deliver goods and services using the most efficient route thus calculating the most optimum delivery schedule/ route. This will reduce, not increase, the number of cars on the road (especially if we combined it with a “cash for clunkers” type scheme to remove older, more heavily pollution vehicles off the road). 2. “Why should car owners get a subsidy and not people who use public transport or ride a bike or walk or never leave the house?” Answer – Even those who never leave the house will benefit if we can reduce carbon emissions and slow climate change. To change people’s buying behaviour you have two choices: a carrot (say a rebate) or a stick (say higher taxes). Carrots are generally considered to be preferable than sticks in public policy to change behaviour. Rebates have already been shown overseas to reduce greenhouse gas emissions by encouraging the sales of EVs’ by changing people’s buying behaviour. Additionally, if we could move towards more electric buses / trams using green power, the users of public transport WILL also benefit from low fares / ticket prices. As you know the reason electric cars currently cost more than traditional cars is because electric car battery packs cost a lot more than combustion engines. It will take time for the economies-of-scale to readjust prices of EVs but one thing is for sure: if the production numbers on batteries and EVs is increased it will lower the prices of both, and this will benefit lower income individuals by allowing access to EVs. With time, and carefully designed public policy, such as subsidies to encourage the industry, a cross-over point will be reached where the price of EVs will be less than petrol powered vehicles. Answer – This issue has already been examined and dealt with in various places overseas. For example, in California the Clean Vehicle Rebate Project which has issued 115,000 rebates worth $295 million to buyers of battery-powered vehicle since 2010 was adjusted in March 2016 to offer higher rebates for low and moderate-income people who want electric cars. So, it is possible to address this issue with good public policy (which is missing in Australia). It is noteworthy that of all the electric vehicles in the USA over 50% of them are in California (largely because of the States use of rebates)…….. ‘nough said. Answer- In my view it’s not a question of either/or. Both should receive subsidies (in the early years) to encourage the transition to a lower carbon emission world. Dependable and consistent funding for zero-emission rebates is the key goal in California in transitioning to a low carbon world. More well thought out public policies are needed here in Australia to encourage this transition. In California, for example, rebates are funded by their ‘cap and trade’ system, which provides funding for the Clean Vehicle Rebate scheme by auctioning the right to pollute to companies that can’t met their emission-reduction goals. Yet here in Australia we are still talking about building new coal fired coal stations / recommissioning old inefficient coal fired power stations / subsidising the Ardani coal mine with up to $10Bil in subsidies …. (insert long groan). With regard to point 1, if you went out shopping and saw bicycles on sale for $200 each you probably wouldn’t get one unless you were sure you actually wanted a bicycle. But if they were $1 each there’s a good chance you’d get one. And if you wouldn’t, a lot of people would. While $1 is an extreme example, if you subsidize a good, in general people will buy more of it. This is true even for things you can’t use more than one of at a time such as bicycles. 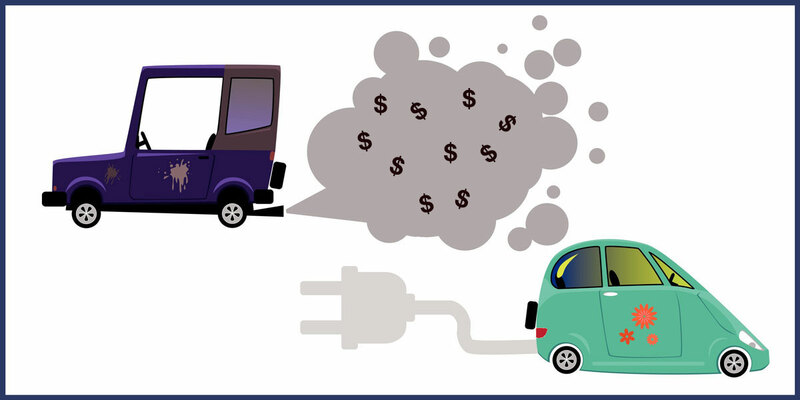 In general I favour of making oil product powered vehicles pay the full cost of their pollution because that is a more efficient way to a cleaner stock of vehicles without increasing the total vehicle stock above what it would be, which might be a considerable waste if self driving electric cars end up eliminating a lot of private car ownership. In practice we may end up with a bit of both. Some pollution externality will be paid for and some subsidies for clearer vehicles will be provided. a thought bubble. Have a subsidy/no interest loan for new electric vehicals but it needs to be paid back over 4 or 5 years. Any outstanding balance to be paid in full if the vehicle is sold. Talk about fiddling (perfect word!) while Rome (The World!) burns. All the doomsday scenarios, and endless ‘factual’, numerical’ and ‘engineered’ calculations about how to avoid them, in reality do little more than avoid the malodourously obvious ‘Truth’. Virtually EVERY problem the world faces ~ including pollution, global-warming, destruction of resources etc etc etc are DIRECTLY caused by one single issue:- Homosapiens breeding like rabbits on Viagra….and, idiotically, being lauded and rewarded for doing so. Even cockroaches (a female can produce up to 40,000 offspring!) can’t compete with the cancerous growth of human mass. Your ideas are good and sensible, but unfortunately the same cannot be said for our political climate. The unique relationship between billionaire media owners (eg. Gina Rhinehart), uneducated people and fossil-fuel-donor-receiving politicians makes it near impossible to make traction on these issues. Any sort of electric car subsidy OR fuel tax increase will be branded as an assault on the battlers who can only afford to live in the outer suburbs and have to drive their ’97 Prado 80,000 km/year in order to service their employment and family duties. Especially when luxury cars like Tesla are the beneficiaries. Never underestimate the power of angry stupid people reading the Herald-Sun. The fact that action is needed, or that the rest of the developed world has long ago started taking action, leads us back to the problem of uneducated voters influenced by corrupt media. If I were to make a suggestion, it would be that strict fuel efficiency standards and electrification targets should be imposed on government and other fleets. This at least begins the process of getting such vehicles onto the roads in significant numbers without triggering backlash. Interest-free loans for more efficient cars are another easy option. For example, I just crunched some numbers on the perennial fleet darling, the Toyota Camry. The non-hybrid base model costs $31,599, the hybrid $33,899. The base averages 7.8L/100 km, the hybrid 4.2. Assuming 15,000 kms/year and $1.30/L fuel, it would only take 3 and a bit years to recover the extra purchase cost (maybe 3.5 years since the hybrid likes 95 octane fuel), not even accounting for the enormous societal benefits of hugely reduced pollution and resource depletion. If we have access to Casio calculators, the non-hybrid model SHOULD NOT EXIST, especially when there is no real compromise in terms of long-term ownership. Yet fleets are often told to get the cheapest model, thinking themselves clever (after all, they can claim fuel on tax…). There is surely some low-hanging fruit to do something about this problem. John I love the sentence “Never underestimate the power of angry stupid people reading the Herald-Sun.” So true. As I sit at home in Adelaide this April 10th while it’s 34 degrees C outside and we haven’t had a decent bit of rain for about 6 months it’s clear that all of this climate change nonsense is just that – nonsense. Electric cars, public transport, renewable energy phhhttt! Still I watched the Third Industrial Revolution on SBS the other week and it suggested that there might be a quid in all of this stuff. I own one of your big 4×4 3lt diesel polluters that I put to it’s designed use as often as I can but probably like many others, would be happy to also get a less polluting vehicle for my many more short trips to the supermarket etc. and even shopping centres where I cannot go now due to height restrictions if I was able to transfer my hugely expensive registration on a either vehicle basis. After all I can only drive one vehicle at a time. Transfer registration to a named driver and a lot of pollution will be avoided. That is one idea. Another is to have registration charges based on the number of kilometers driven. That way people could get a short range electric car, or a hybrid, or a smaller and more efficient car, and keep and old petrol or diesel burner if they feel they’ll need to use it occasionally without doubling what they have to pay in rego. You seem a bit cheeky with U.S. comments and Trump slights. I am not real high on some things either one does but a solar forum is not the venue to take shots. Please feel free to make as much fun of Australia and our Prime Minister as you like. It’s the Australian way. Many of us Ozzies got our initial training in ‘taking shots’ from watching various Federal and State Parliament ‘question time’ sessions on TV during our high school days. Leaving that aside … President Trump has somewhat of a history of ‘taking shots’ at the ‘renewables’ industry – if you do a search using ‘trump comments about renewable energy’ as the term, you’ll find a few of them.